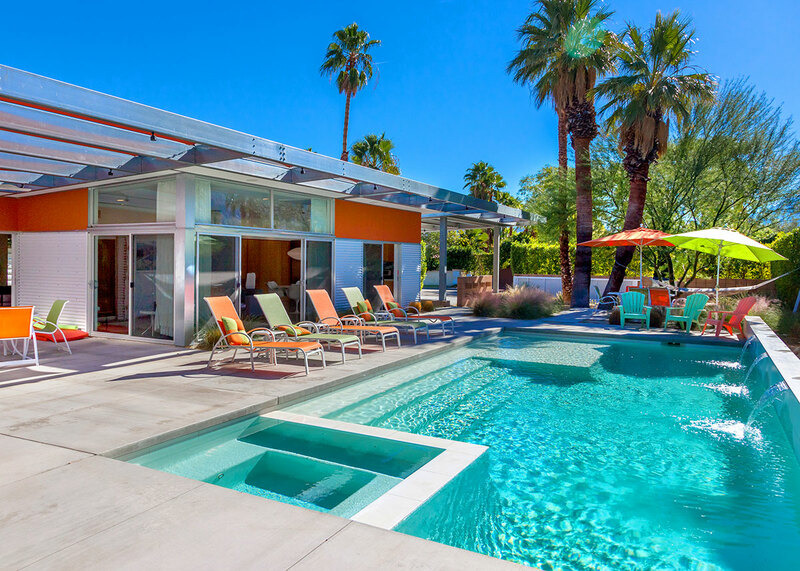 All new construction, completed in 2012, this Glass & Steel House is one of Palm Springs' most respected and admired contemporary homes. 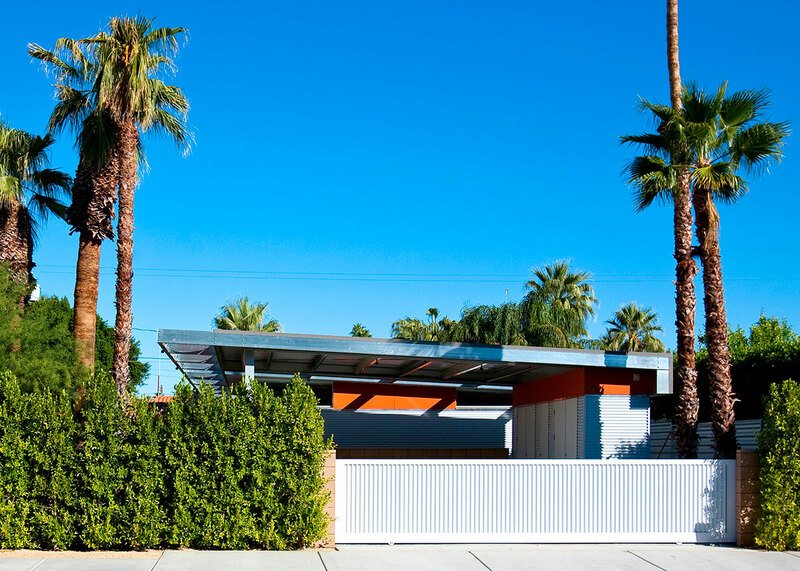 Lauded as the perfect example of what's next in desert architecture and design, this private, gated property has been published in magazines, design blogs and newspapers. 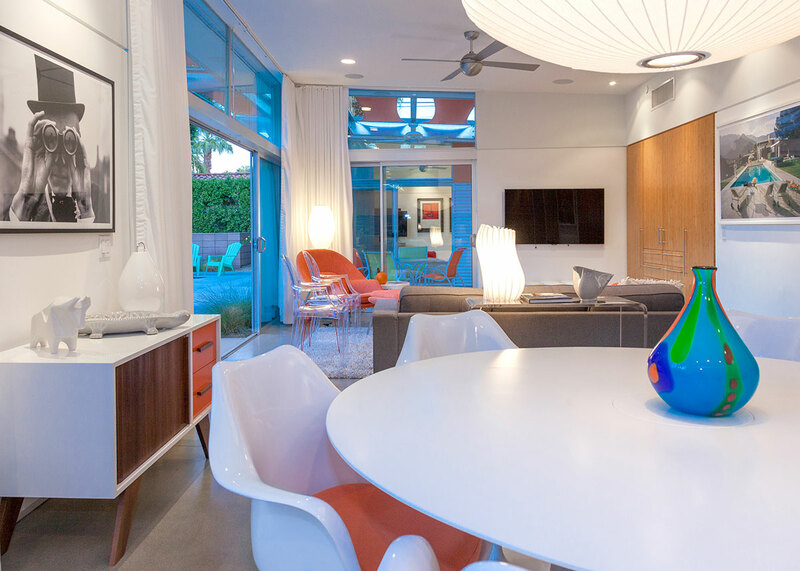 It was showcased during Modernism Week, and served as the host location for the annual kickoff reception for the Palm Springs Art Museum's Architectural and Design Council. 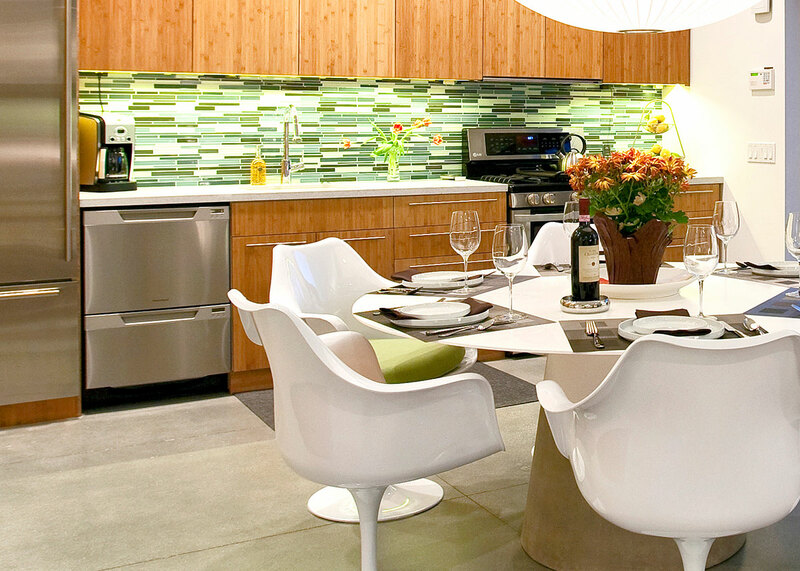 It has also been featured on numerous home tours. 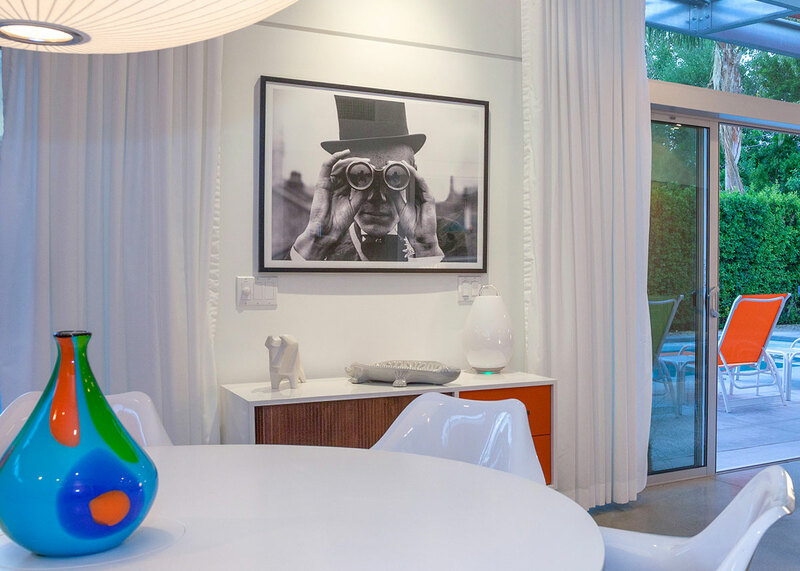 Now, this celebrated private residence is available as a luxury vacation rental home. 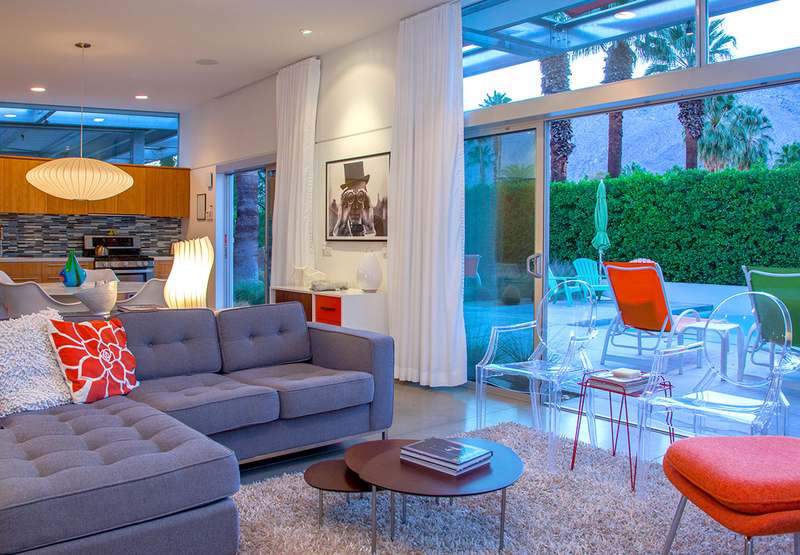 The spacious open floor plan features walls of glass, blurring the lines between indoor and outdoor full advantage of the panoramic mountain views. The European chef's kitchen has been space planned for individual and team meal prep. 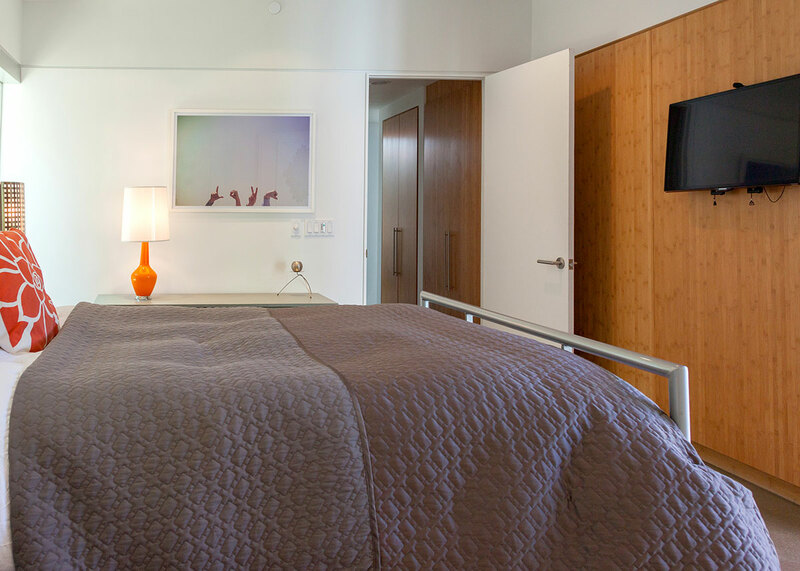 The entire home has been appointed with luxury upgrades like a whole-house sound system (Sonos), large screen Smart Televisions, state of the art climate control heating and air conditioning, and all the bells and whistles you'll need to make your stay memorable. 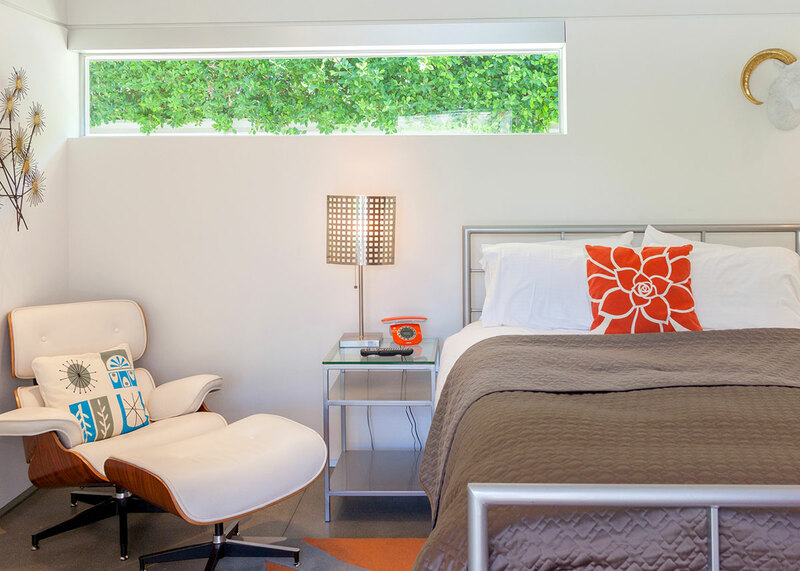 The main house offers two modern Queen guest quarters that share a bath and each have direct patio access. 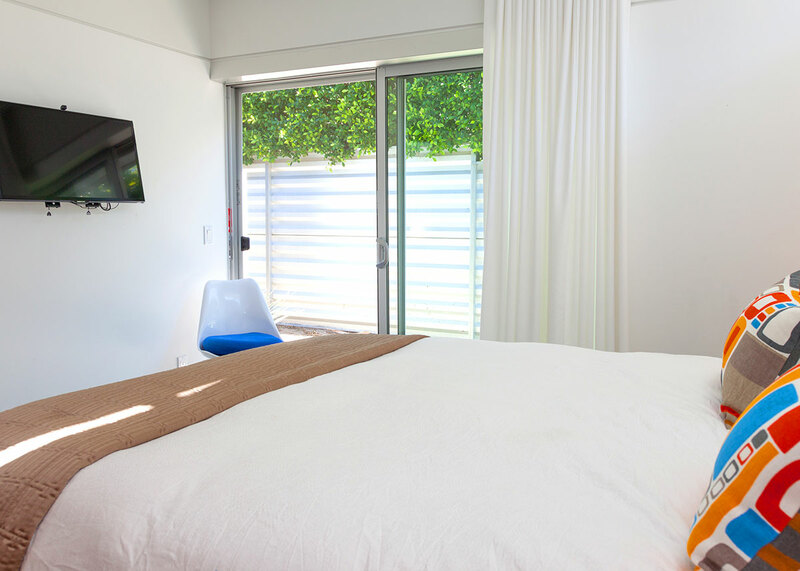 The master suite is set apart in the private casita featuring a Queen bed and direct pool access. 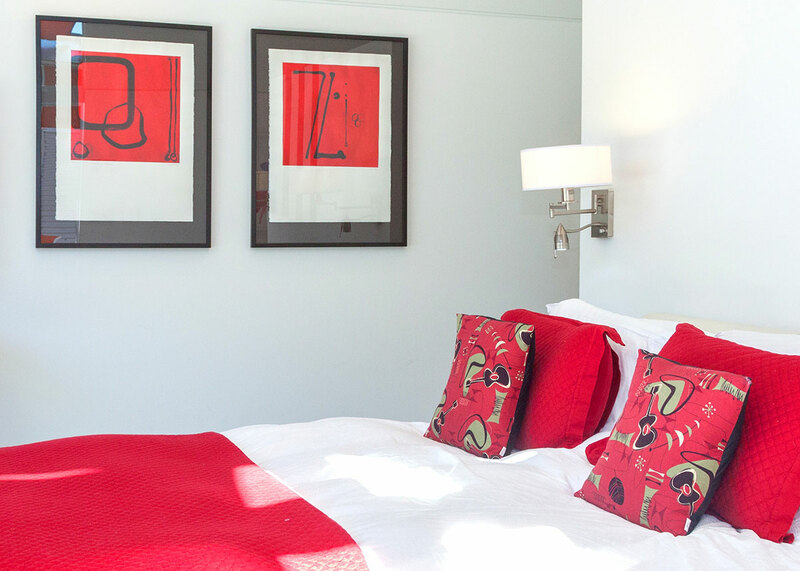 All of the bedrooms have flat screen televisions and are beautifully decorated. 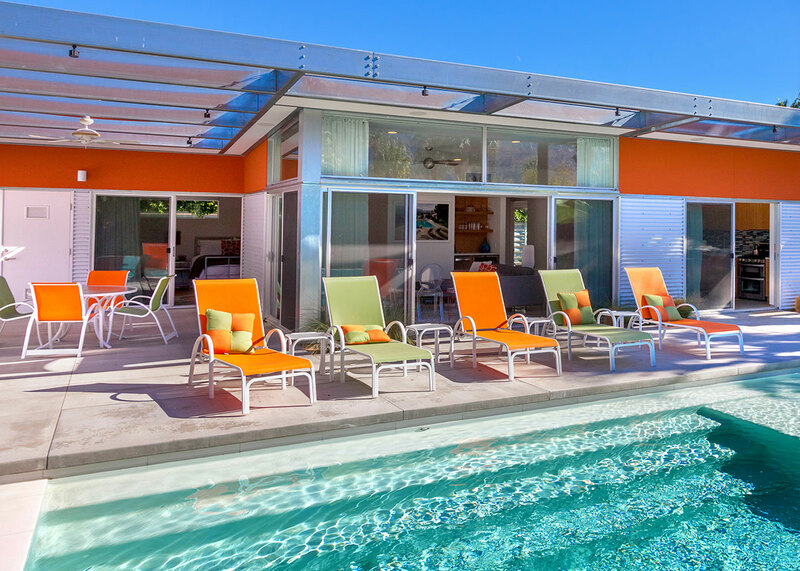 Designed for relaxed desert living, you'll find wow-factor amenities like outdoor showers, fire features and water elements that add to the luxurious appeal of this mini resort. 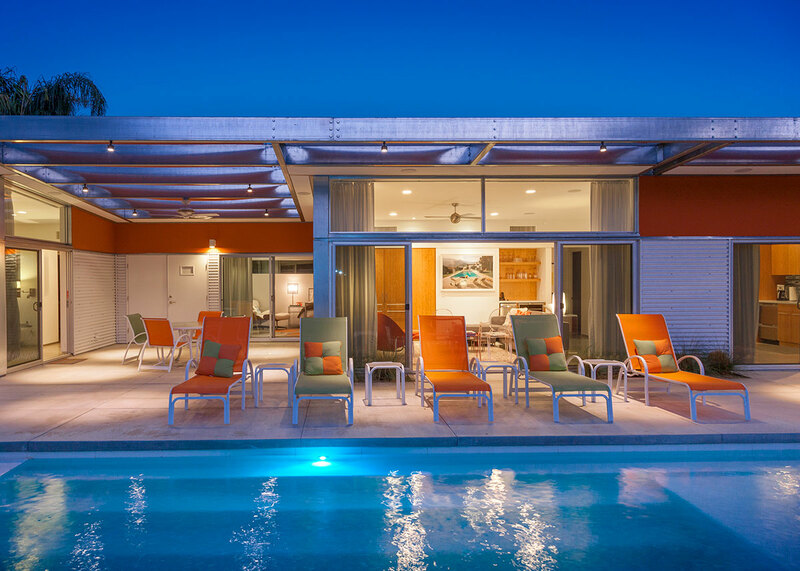 The heated in-ground pool features an integrated spa and tanning shelf, and the west-facing terrace is perfect for catching beautiful desert sunsets as the light fades behind the mountains. 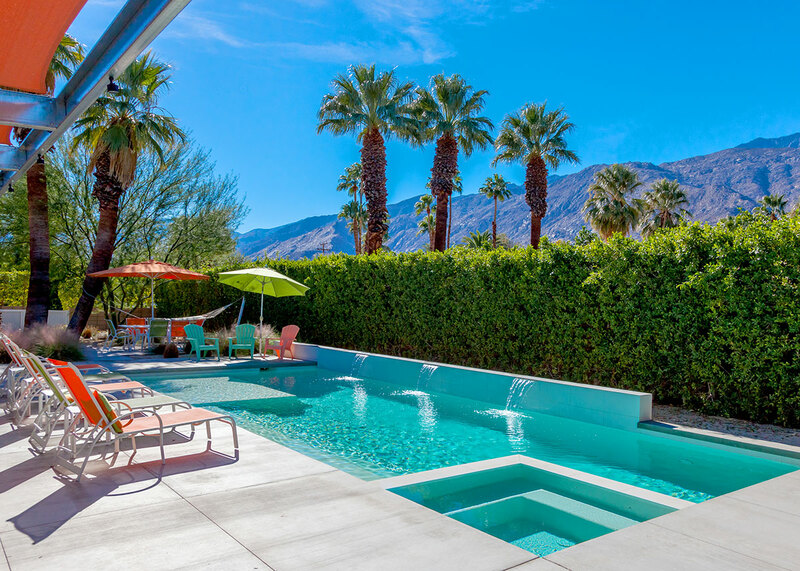 There are three outdoor dining areas, a barbecue, and plenty of comfortable poolside seating to accommodate festive group gatherings as well as quiet private moments off to the side. 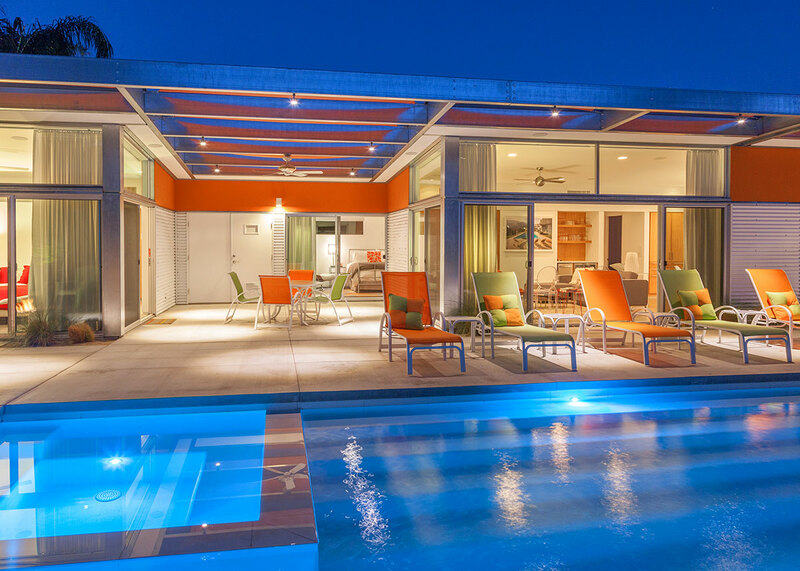 The lush greenery and dramatic landscape lighting compliment the striking architectural design and mid-century inspired furnishings - creating a spectacular, awe-inspiring vacation home that is truly magical. 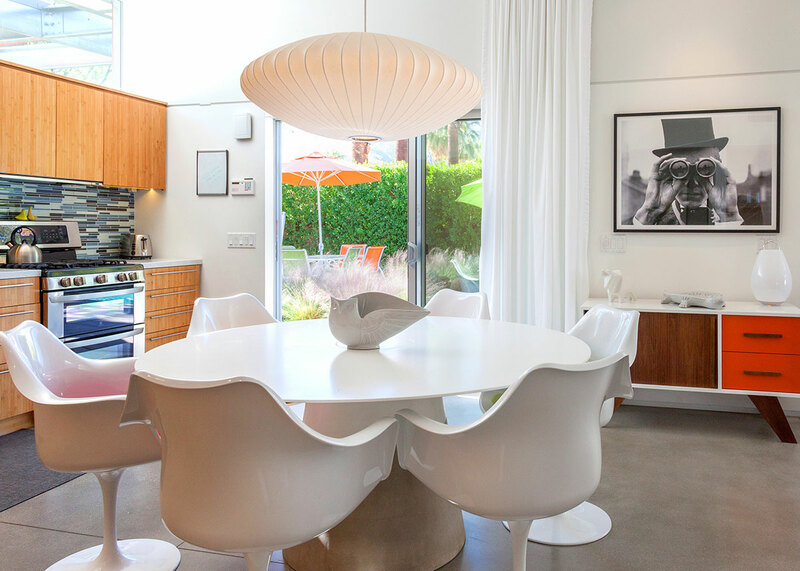 Located very close to Ruth Hardy Park and within walking distance to the Palm Springs Uptown Design District, Glass & Steel 2012 is an impressive, spectacular property that is well suited for extended weekends, week and month long stays and as a seasonal rental. It is perfect for small groups, families, romantic getaways, couples' weekends and celebrating milestone occasions like anniversaries and birthdays. This is a very special property. Advanced bookings strongly suggested. Absolutly devine house, location, and appointments! 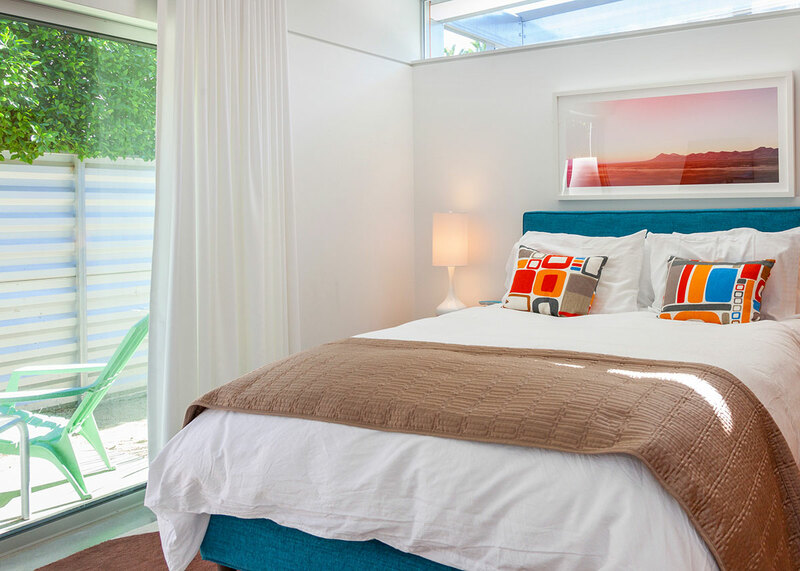 "Glass and Steel House did not disappoint and actually exceeded our expectations. It is very well appointed. We went over the Thanksgiving weekend and got all the goodies at a nearby Jensen's grocery store to make a full holiday dinner. The kitchen was very well stocked with pots and pans, serving dishes and all the cooking utensils you would need to make a Turkey feast. We has a few minor issues that required a phone call and they sent someone over within 15 minutes both times to make sure we were good to go. The location was fantastic. It was very close to downtown by Lyft or Uber and it was a very safe neighborhood." What a wonderful retreat. Open, sunny, clean and well stocked. 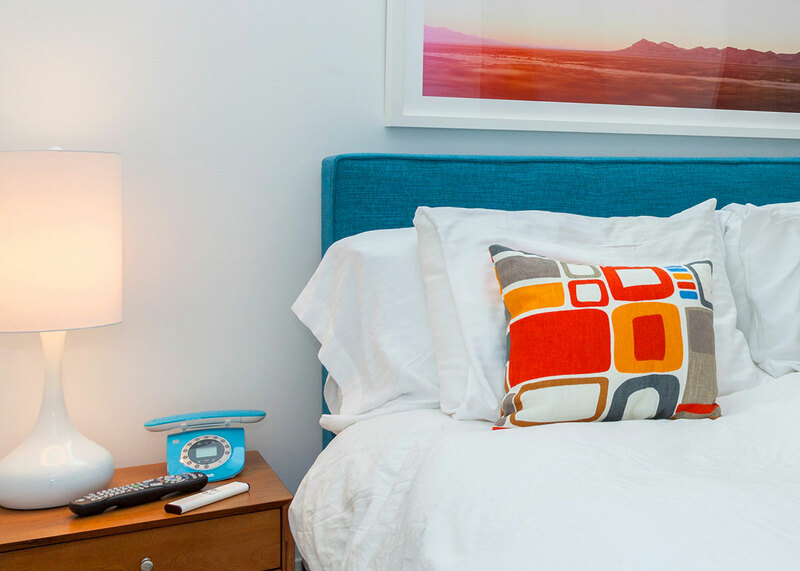 "Our stay was relaxing from the moment we walked in. The concierge met us on arrival to make sure we had everything we needed. Communication and service were top notch, and the house was beautiful, well appointed, and comfortable. Very walkable neighborhood, close to downtown. 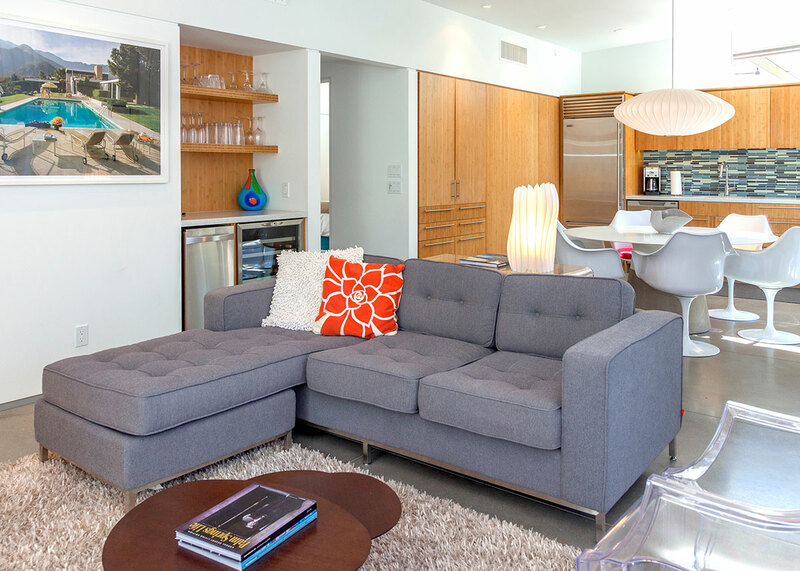 We would rent here again in a heartbeat." "Great house that has everything one could need on a vacation. Extremely well maintained and clean. Convenient location with easy check in and out. 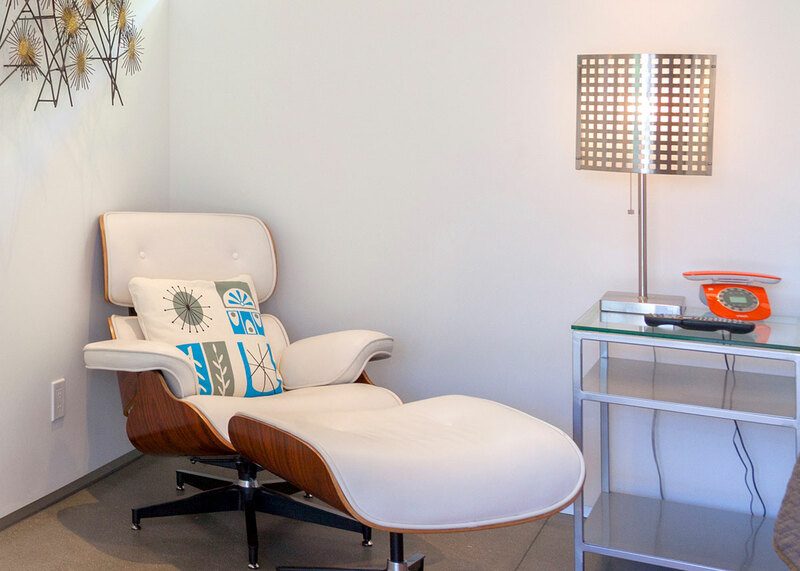 If you just want to relax, swim or read a book this is the perfect setting." Could have not asked for anything better. 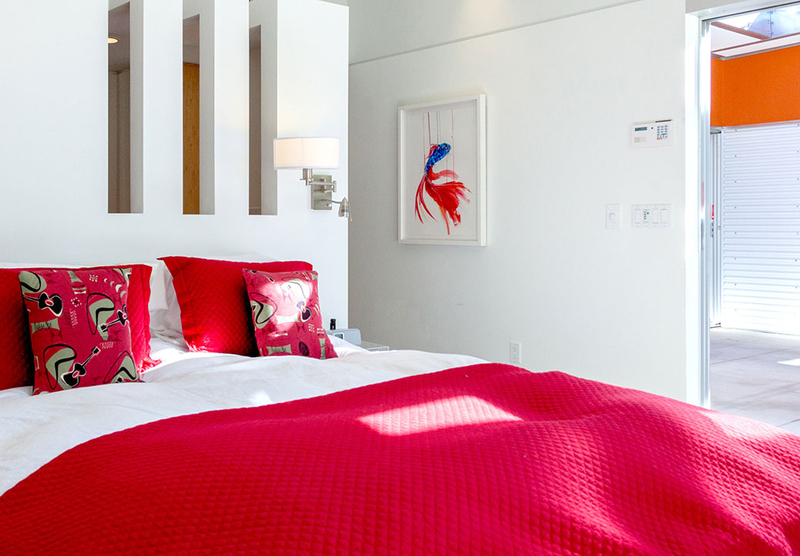 "We had the best time staying here! The house was so well maintained and clean and the outside pool area was better than I could have imagined. We had a couple maintenance issues that were taken care of right away. We would come back here in a second!" 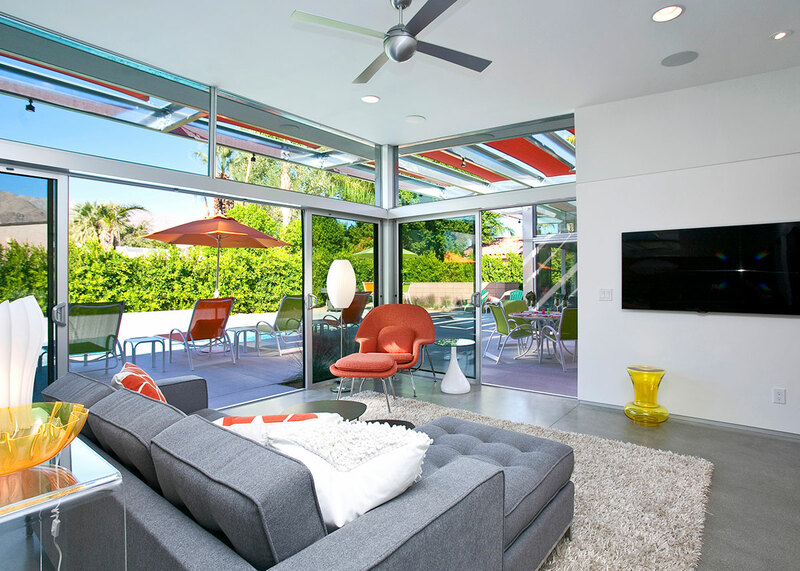 Love the Glass and Steel House! "We had a great time at the Glass and Steel House in July, 2018! The house is beautiful and very well-designed. It's also well-located near Ruth Hardy Park. Great place for families or as an adults-only get away. We love renting from ACME as they are very responsive and organized. Thanks for another great rental experience!" 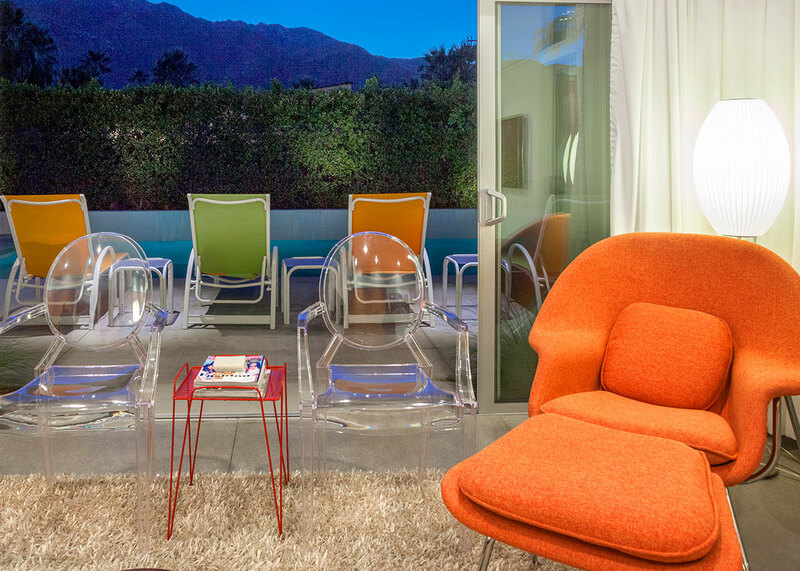 "Loved everything about the property! The Mountain View’s were spectacular. The management company took care of our every need. We are definitely coming back to stay." "I just returned from a long weekend vacation with 5 friends at the "Glass and Steel House 2012." 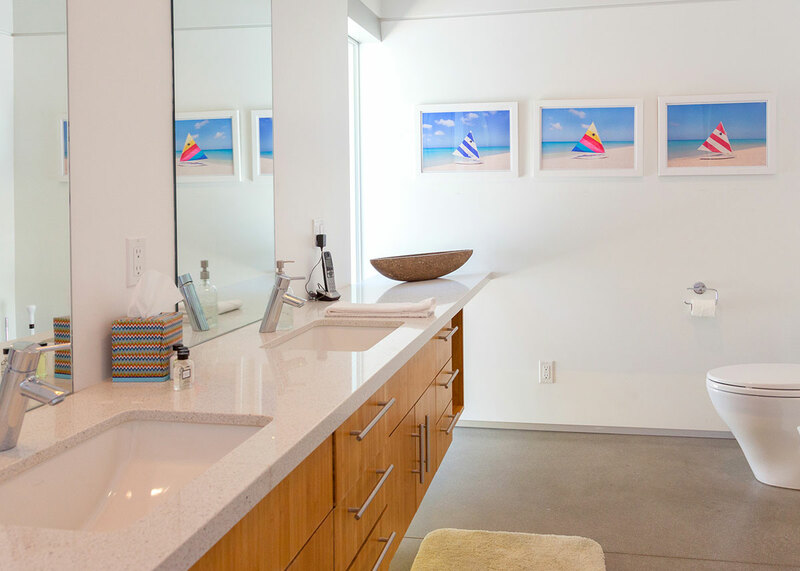 It is truly an amazing vacation rental because as soon as you arrive you feel you are on vacation. We ended up not going out much because the home was such a wonderful and relaxing retreat. 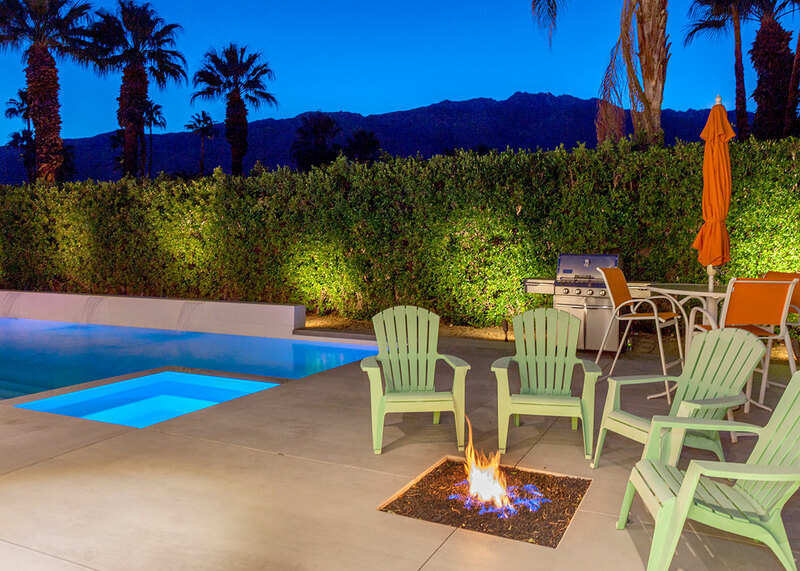 It is very comfortable for cooking, grilling out, laying by the pool, having a slumber party and watching movies. It has a gorgeous view and impressive interior design. The kitchen has everything you need and comes stocked with spices, teas, oil, cooking essentials, etc... Cannot say enough about what a peaceful and gorgeous place it is." 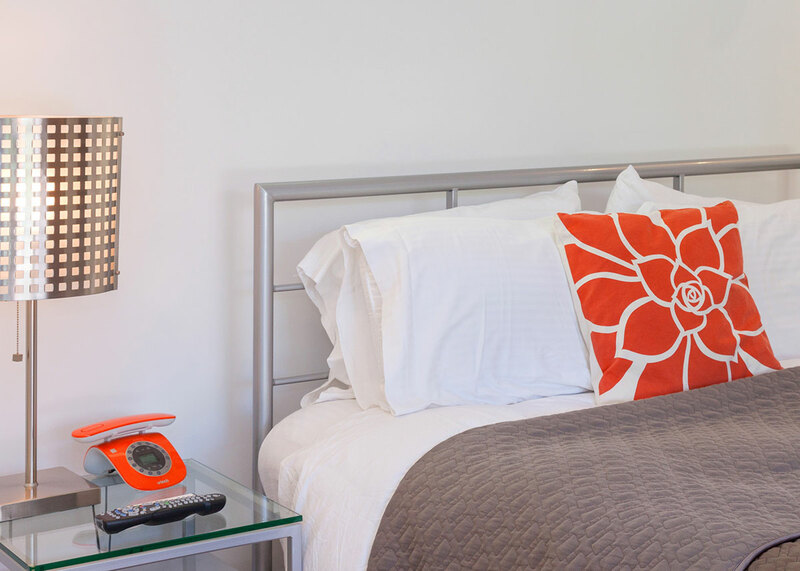 "An excellent stay overall! Excellent comfort, cleanliness, and style! Thank you!" 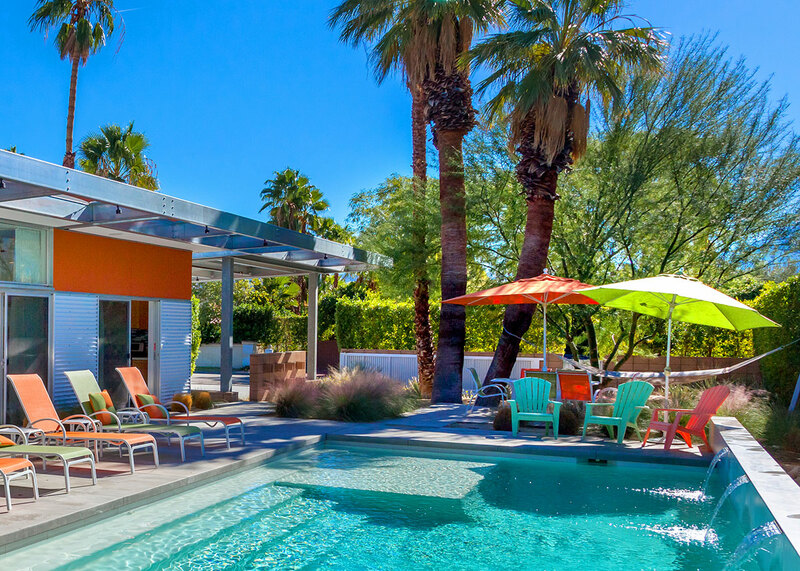 A cool retreat in the hot desert! 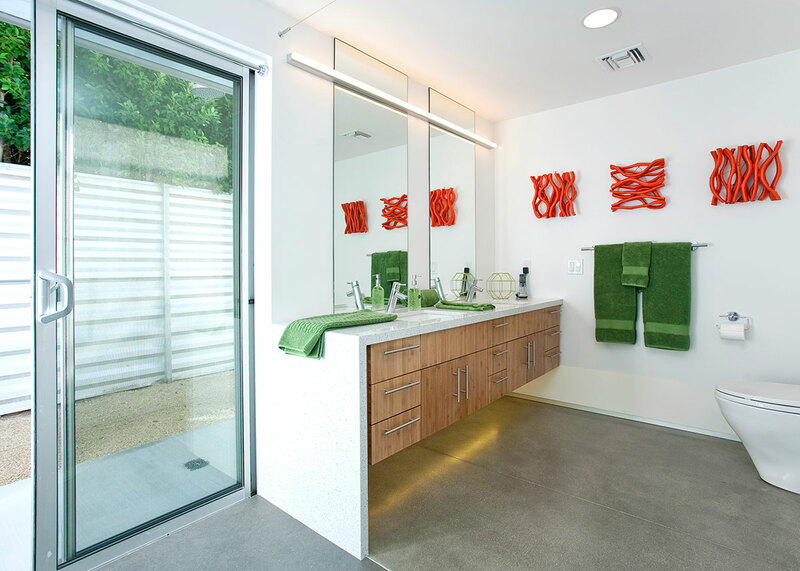 "This house was a great choice because we liked the area it was located in, and the modern look of the house. The outdoor area was our favorite part. The pool area was great morning, noon and night! Very comfortable. Biggest surprise was how quiet the neighborhood was. We were there when it was extremely hot (110-120) and the house stayed nice and cool. Was a good place to retreat when not in the pool. " "Gorgeous home in a fabulous locations. 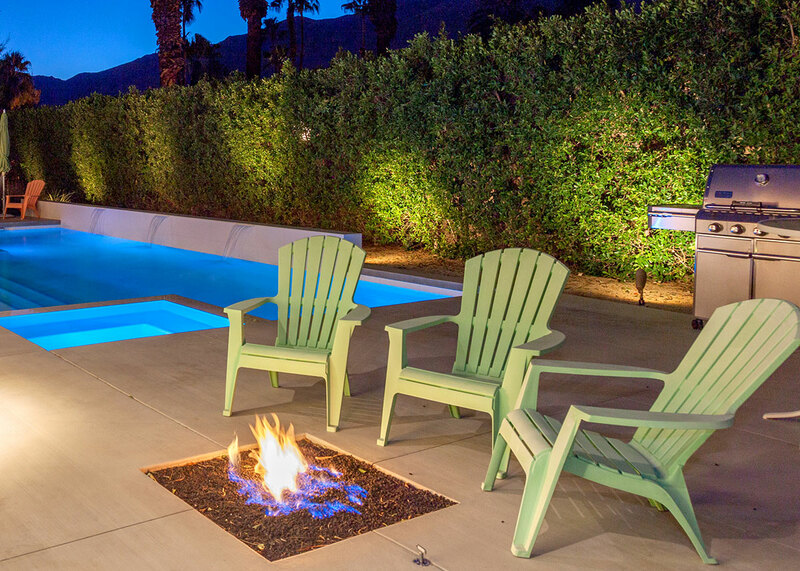 Tons of private, outdoor space to entertain and an incredible, relaxing pool. 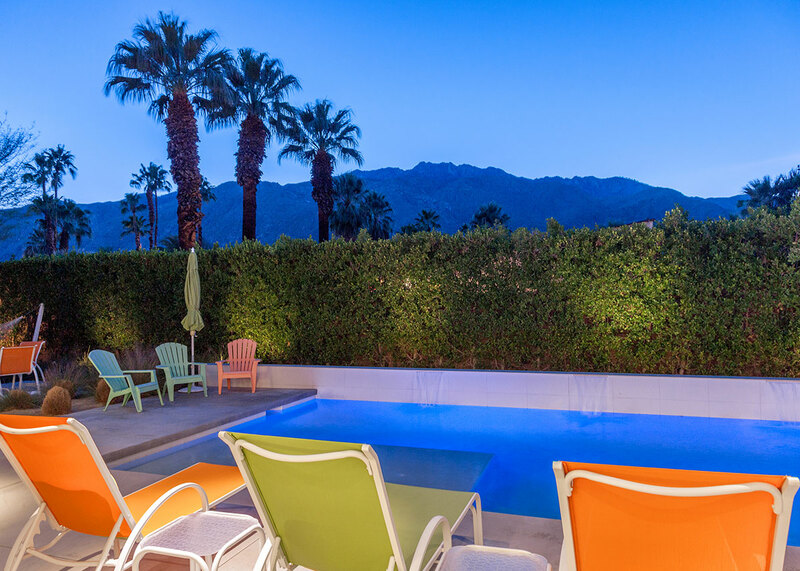 Made our stay in Palm Springs truly special. Could not recommend it more highly! " 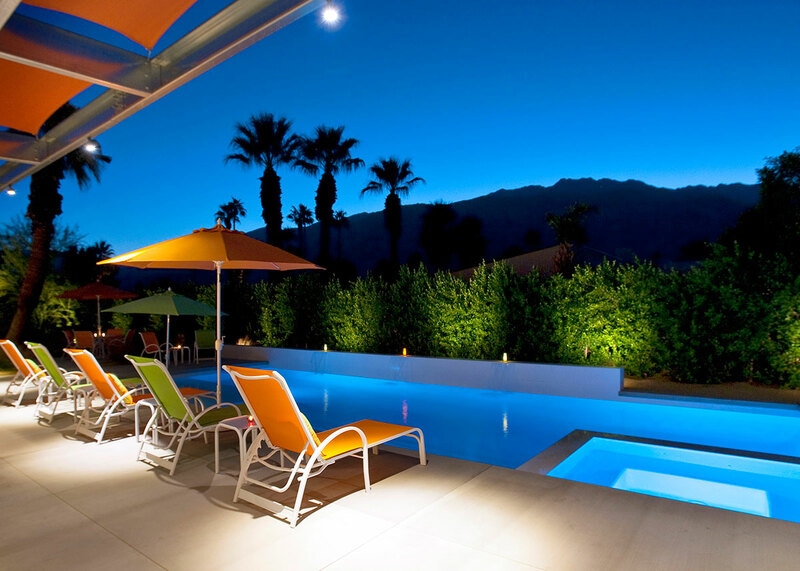 "We stayed here in July, and between the pool and the AC, we stayed relaxed and cool. I have stayed in quite a few rentals, and I must say this is by far the best rental I have ever stayed in! Everything was clean and new. Great technology throughout the home and back yard. We have already booked another stay at this location." "Not a complaint! 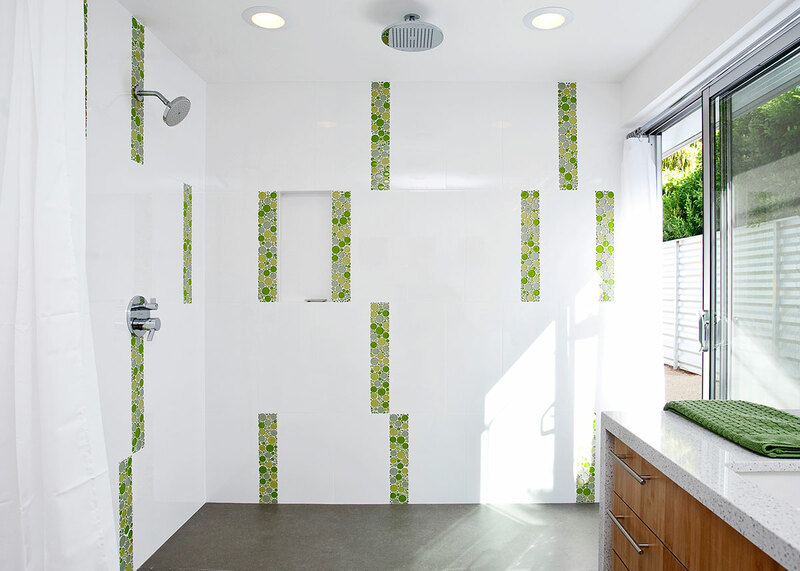 Excellent cleanliness, and very good comfort and style to the home! Overall, it met all our expectations!" "This was a wonderful house -- perfect for us. My husband is ill and this was a family gathering and a relaxing time for us. Everything was wonderful -- set up, beach towels, everything we could have thought of -- including salt and pepper. 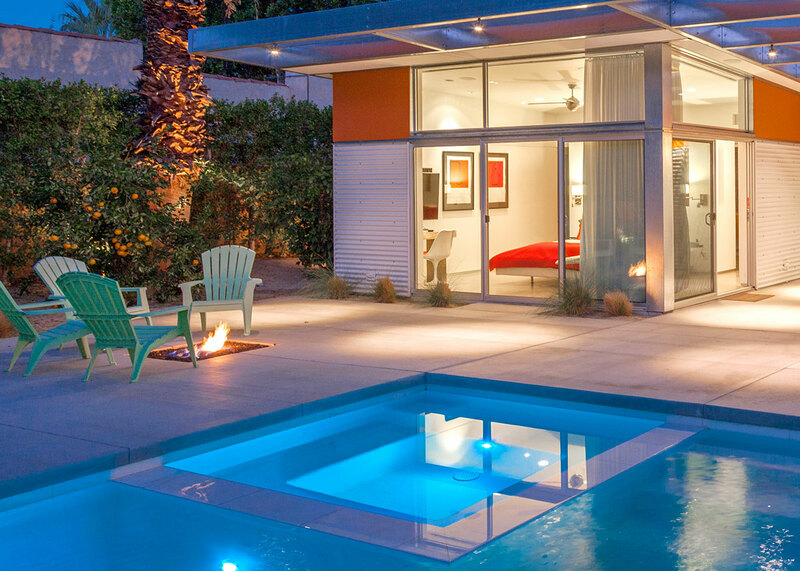 Really enjoyed the interesting and attractive house and pool. Best part was the care free relaxing environment including the water feature. 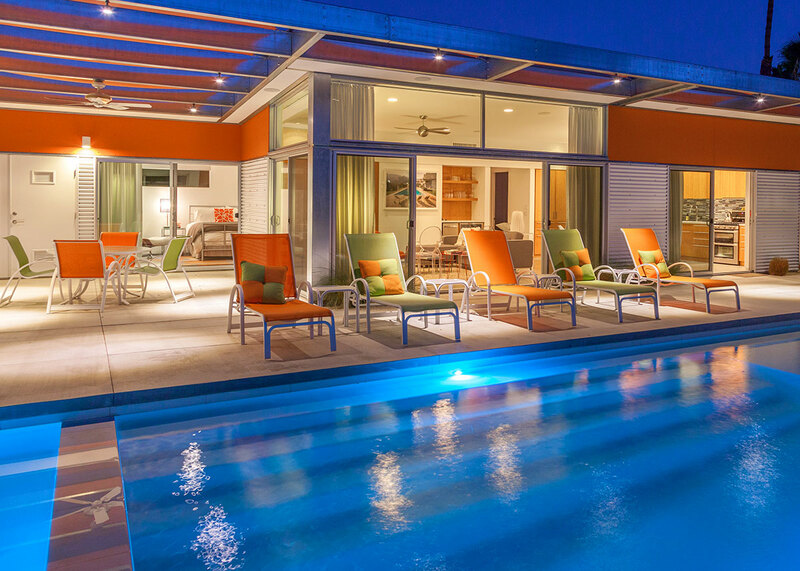 The amenities in the house and the wonderful pool added to the relaxing environment. " A Nice Time With Family! 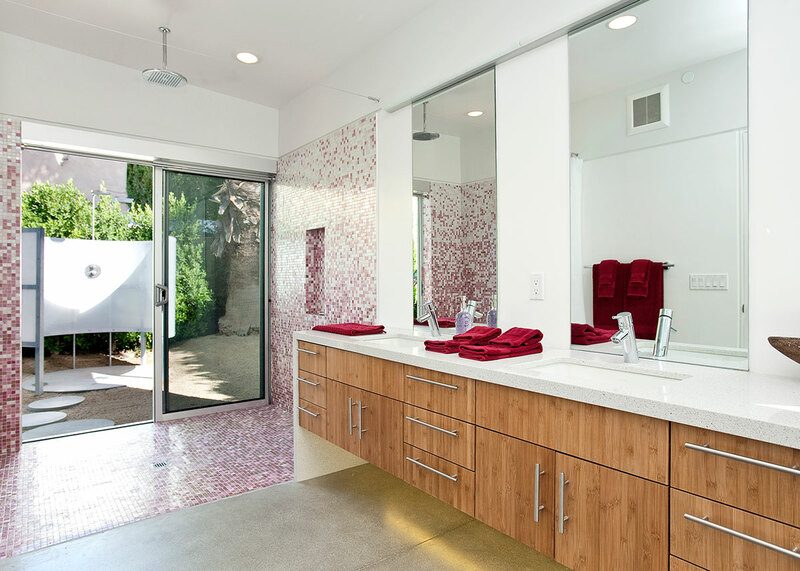 "We really liked the layout of the house, and the pool was perfect for a toddler. We really enjoyed the quiet setting, and getting sun all day,too! It was a great stay!" "Consistently excellent. Like that we get to go straight to the property, so easy and fast, and ready to enjoy the house! The view of the mountain is perfect from all rooms in the house. We'll be back!" 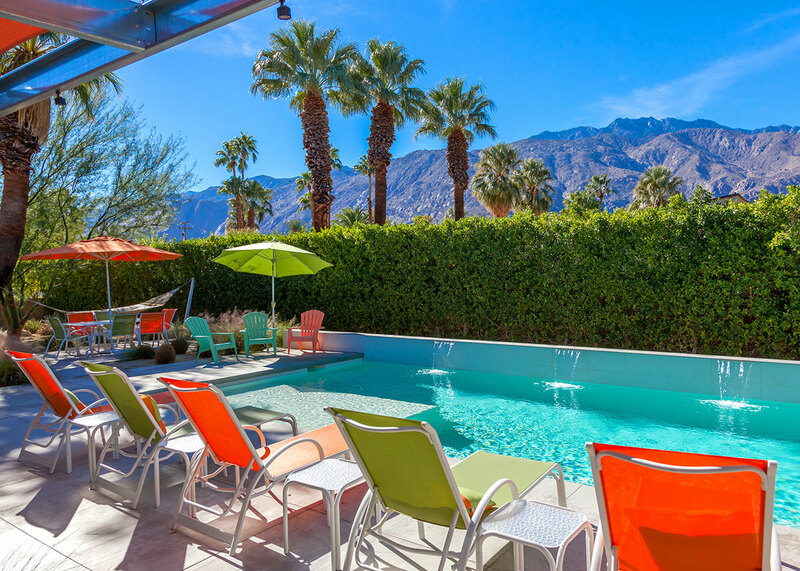 "We have rented from several different companies in Palm Springs, however the houses we rent through ACME House Co. are always "as advertised" and very clean. Really loved the quiet neighborhood and wonderful outdoor space. The best surprise was the hammock under the Palo Verde tree! " "Location. Style. Comfort. The Views. Everything was perfect for us. 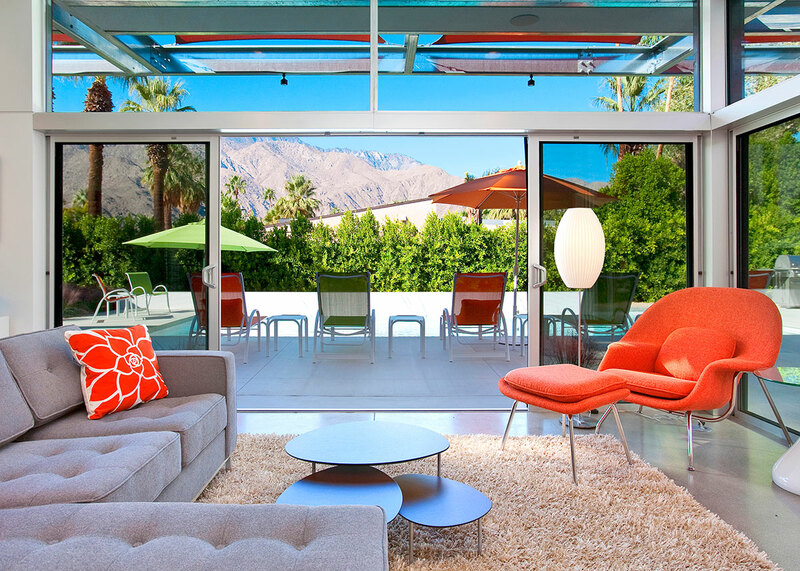 Great outdoor spaces, Cool mid mod vibe. House is even better in real life than the photos. Highly recommend." "Love the Ruth Hardy Park area! We loved the house, and enjoyed the pool area, and quiet neighborhood! A very nice house, and we would love to rent it for a longer winter season! " "ACME House Co. provided us with great, efficient service, and likely the only rental company we'll use when traveling to the area. 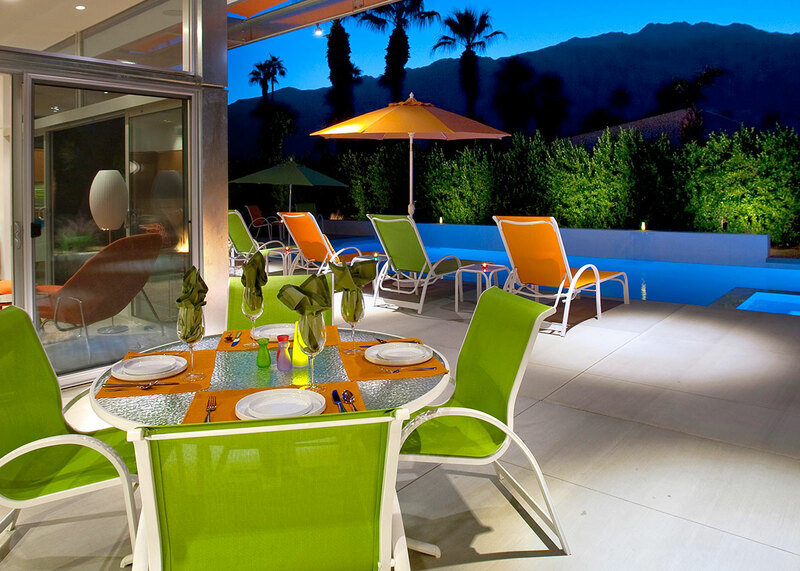 We are interested in being a vacation home owner, and wanted to test the experience. When there was an issue, we liked how fast and effective your team was in handling it. We really liked how well stocked the kitchen was, as well as there being no shortage of blankets and towels. Overall great service, and we were very happy with the experience. " Manager Response: Thanks for the feedback Patrice. Glad you and yours had a great time! Spectacular! We Will Be Back! "Very cool house. 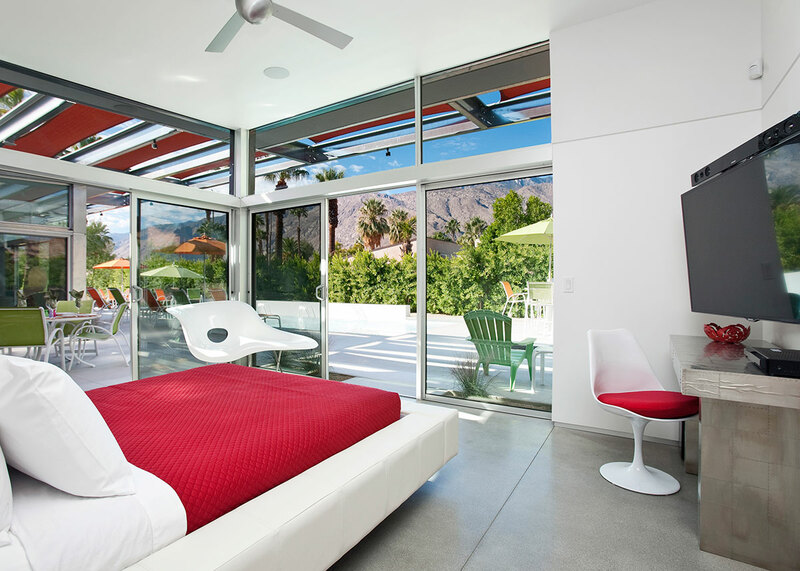 Hubby and I are big fans of Palm Springs and its architecture. Steel & Glass House was perfect for us. Great location. Fabulous pool. Gorgeous mountain views. Loved the furniture. The house was very clean and comfortable. We will be back."